HIV immunity is likely CD4 T cell dependent. HIV-specific CD4 T cell proliferative responses are reported to correlate inversely with virus load and directly with specific CD8 responses. However, the phenotype and cytokine profile of specific CD4 T cells that correlate with disease is unknown. We compared the number/function of Gag p24-specific CD4 T cells in 17 HIV-infected long-term nonprogressors (LTNPs) infected for a median of 14.6 years with those of 16 slow progressors (SPs), also HIV infected for a median of 14 years but whose CD4 count had declined to <500 cells/μl. Compared with SPs, LTNPs had higher numbers of specific CD4s that were double positive for IFN-γ and IL-2 as well as CD28 and IL-2. However, CD4 T cells that produced IL-2 alone (IL-2+IFN-γ−) or IFN-γ alone (IFN-γ+IL-2−) did not differ between LTNPs and SPs. The decrease in p24-specific CD28+IL-2+ cells with a concomitant increase of p24-specific CD28−IL-2+ cells occurred before those specific for a non-HIV Ag, CMV. p24-specific CD28−IL-2+ cells were evident in LTNPs and SPs, whereas the CMV-specific CD28−IL-2+ response was confined to SPs. The difference between LTNPs and SPs in the Gag p24 IFN-γ+IL-2+ response was maintained when responses to total Gag (p17 plus p24) were measured. The percentage and absolute number of Gag-specific IFN-γ+IL-2+ but not of IFN-γ+IL-2− CD4s correlated inversely with virus load. The Gag-specific IFN-γ+IL-2+ CD4 response also correlated positively with the percentage of Gag-specific IFN-γ+ CD8 T cells in these subjects. Accumulation of specific CD28−IL-2+ helpers and loss of IFN-γ+IL-2+ CD4 T cells may compromise specific CD8 responses and, in turn, immunity to HIV. Viral, genetic, and host immune responses contribute to delayed HIV disease progression in so-called HIV-1-infected long-term nonprogressors (LTNPs)3 (1). In terms of host responses, the CD8 T cell response to HIV is vital in the acute phase of infection by controlling virus expansion (2, 3). Strong broadly directed HIV-specific CD8 T cell responses are also evident in the chronic phase, more in LTNPs than in progressors (4, 5, 6), and waning in CTL responses correlates with markers of disease progression (7). In addition to specific CD8 responses, immunity to HIV, like that to other chronic virus infections (8, 9), is likely to be CD4 T cell dependent (10, 11). Specific CD4 T cells contribute to viral clearance through a variety of mechanisms, including help for CD8+ and B cell responses, the production of effector cytokines, and cytolysis (12). HIV-specific CD4 T cells govern the induction (13) and subsequent magnitude of an HIV-specific CD8 T cell response (10, 14). HIV-specific CD4 T cell proliferative responses correlate positively with levels of specific CTL precursors (14), and a direct inverse relationship with virus load has also been noted (15). Therefore, LTNPs with low virus loads have higher levels of HIV-specific CD4 proliferative responses compared with those of patients with disease (15, 16). Apart from governing the magnitude of CD8 responses, CD4 help may be necessary for maintaining specific CD8 T cell function. Thus, expression of the cytolytic protein perforin appears to be selectively impaired in HIV-specific CD8s in all stages of HIV infection (17, 18). However, the phenotype and cytokine profile of HIV-specific CD4 T cells that correlate with disease progression are presently unknown. Precisely which CD4 subsets influence the magnitude of the specific CD8 response also remains unclear. There is increasing evidence that, in contrast to the HIV-specific proliferative response, specific CD4 cells defined by IFN-γ production alone are preserved in all stages of HIV infection and do not correlate with either the magnitude of the specific CD8 response (19) or disease markers (16, 20, 21). This discordance between IFN-γ production and proliferation is not due to a lack of proliferative capacity by specific IFN-γ+ CD4 cells per se; rather, it has been attributed to other defects in lymphoproliferation (22). Indeed, two recent studies show that a subset of IFN-γ-producing CD4 T cells, one that secretes both IFN-γ and IL-2, rather than the subset that secretes IFN-γ in the absence of IL-2, is associated with good clinical outcome in HIV infection (23, 24). These two studies measured the magnitude of the IFN-γ+IL-2+ response of HIV patients to mitogen stimulation (23) or by activation of the Vβ+ T cell pool with staphylococcal enterotoxin B (SEB) (24) but did not look at specific responses. Whether the specific IFN-γ+IL-2+ CD4 T cell response is also associated with good clinical outcome in HIV infection is therefore unknown. We tested the hypothesis that the combined expression of IFN-γ and IL-2 as well as CD28, rather than production of IFN-γ alone, by HIV-specific CD4 T cells is important in nonprogression following HIV-1 infection. In addition to IL-2, T cell proliferation is critically dependent on costimulation through the CD28 pathway (25, 26), which is disrupted in HIV infection (27, 28, 29). We adopted the increasingly used strategy of stimulating blood cells with HIV-specific overlapping peptide panels and then enumerating the ensuing specific cytokine-producing cells by intracytoplasmic cell staining (ICS). A cross-sectional study was conducted of Gag p24- and total Gag-specific CD4 subsets in treatment-naive asymptomatic and symptomatic subjects who had been chronically infected with HIV-1 for a period of >14 years, HIV-infected LTNPs and slow progressors (SPs), respectively. We demonstrate that Gag-specific CD4 T cell subsets defined by IL-2 production and CD28 expression, rather than the capacity to produce IFN-γ alone, are associated with long-term nonprogression after HIV-1 infection. Samples were taken from members of a previously well-characterized HIV-infected cohort, established in 1995, of 165 long-term HIV-1-infected volunteers attending clinics in London, U.K., who had been enrolled into a nested case-control study of the biological and behavioral correlates of nonprogression in HIV-1 infection (30). In the original cohort, 46 subjects were defined as LTNPs based on a stable CD4 T cell count >500 cells/μl at 8 years of infection, 92 were defined as SPs based on a CD4 T cell count <500 cells/μl at 8 years of infection, and 27 were defined as rapid progressors who developed AIDS within 5 years of infection. The study was approved by the local ethics committee and written, informed consent was obtained from all subjects. We identified a subgroup of 16 LTNP and 12 SP patients from the original cohort (30) and an additional 1 LTNP and 4 SPs who fulfilled the above criteria for inclusion in this study. It was not possible to have a comparison group of individuals with more rapid HIV progression, as all the original rapid progressors had commenced therapy or since died. LTNPs (n = 17) were defined as individuals who had been HIV infected for at least 12 years and had remained asymptomatic with a CD4 cell count >500/μl. Median duration of infection of the LTNPs was 14.6 years. SPs (n = 16) were defined as individuals who had been HIV infected for at least 10.5 years but whose CD4 cell count had declined to 500 cells/μl at the time of study. Median duration of infection of SPs was 14.4 years. All LTNPs were Caucasian. The SP group consisted of 13 Caucasians and 3 Caribbean blacks. All 33 subjects included in this study were antiretroviral naive at the time of sample evaluation. For 94% of patients (31 of 33), viral loads and absolute CD4 counts were determined within 3 mo of blood sampling; 14 were analyzed at the same time as blood sampling, 5 within the first month, 9 within the second month, 3 within the third month, and 2 within 3–6 mo. The median virus load in the 17 LTNPs was 2,852 (range = 50–104,000) and in the 16 SPs was 62,577 (range = 1,002–289,191) (p = 0.0004). The median CD4 count (cells/μl) in the LTNPs was 663 (range = 497-1993) and in the SPs was 303 (range = 85–548) (p < 0.0001). However, despite these differences, because only SPs who had not yet received antiretroviral therapy were selected for inclusion, and despite their CD4 count of <500 cells/μl, these patients at the median 14 years of infection may not differ substantially from the LTNPs. The following anti-human cytokine mAbs were used: anti-IFN-γ-FITC clone B27, anti-IL-2-PE clone MQ1-17H12, and anti-IL-2-APC clone (MQ1-17H12) (all from BD PharMingen, Cowley, Oxford, U.K.). Phenotypic markers were stained with the following mAbs: CD3-APC clone HIT3a, CD28-PE clone CD28.2, CD8-CyChrome clone RPA-T8 (all BD PharMingen), CD3-FITC clone HIT3a (DAKO, Cambridge, U.K.), and CD69-PE clone CH/4 (Serotec, Oxford, U.K.). Costimulatory anti-human CD28 (CD28.2) and CD49d mAbs were purchased from BD Biosciences (Oxford, U.K.). Brefeldin A was purchased from Sigma-Aldrich (Poole, U.K.). PBMC were isolated from heparinized blood by density gradient centrifugation on Lymphoprep (Nycomed, Oslo, Norway), within 24 h of venipuncture. PBMC were preserved at −70°C in FCS (Sigma-Aldrich) plus 10% DMSO (Sigma-Aldrich), in aliquots of 5–20 × 106. PBMC were thawed rapidly at 37°C, washed and resuspended in RPMI plus 10% FCS with 0.5 μg/ml each of anti-CD28 and -CD49d Abs (BD Biosciences) in 24-well plates at 1 × 106 per ml and cultured with Ag for 20 h at 37°C. Ags used included a single pool of 22 HIV-1 Gag p24 peptide 20-mers that overlapped by 10 aa (National Institute Biological Standards and Control, Potters Bar, U.K.) used at a final concentration of each peptide at 1 μg/ml. A pool of 122 15-mer Gag-specific peptides overlapping by 10 aa that covered the entire Gag sequence corresponding to strain HXB2 (obtained through the National Institutes of Health AIDS Research and Reference Reagent Program, Bethesda, MD) was also used at a final concentration of each peptide at 1 μg/ml. Other Ags included CMV lysate (BioWhittaker, Walkersville, MD) at 1% stock solution or CMV lysate (Advanced Biotechnologies, Columbia, MD) at 10 μg/ml; SEB at 200 ng/ml (Sigma-Aldrich). Protein transport inhibitor, brefeldin A (Sigma-Aldrich) was added at 5 μg/ml for the last 16 h of the stimulation. Stimulated cells were washed once and permeabilized with Orthopermeafix (Ortho-Clinical Diagnostics, Amersham, Berks, U.K.), as per manufacturer’s instructions, and stained. PBMC (3 × 105 per well) were plated out in a 96-well U-bottom Flexi-plate (Falcon; Marathon Lab Supplies, London, U.K.) and stained in a single step with a mixture of Abs for 40 min at 4°C. The following Ab combinations were used: CD3/CD8/IFN-γ/IL-2; CD3/CD8/CD69/IFN-γ; and CD3/CD8/CD28/IL-2. Stained samples were washed three times in cold PBS plus 2% BSA and then resuspended in PBS plus 2% BSA plus 1% FCS. For each analysis, 100,000–400,000 events were acquired using CellQuest software (BD Biosciences) on a FACSCalibur flow cytometer (BD Biosciences). The lymphocyte gate was defined manually on forward and side scatter characteristics for each sample. CD4 T cells were defined as the CD3+CD8− subset within the live lymphocyte gate. Analysis of cytokine production was performed within the CD3+CD8+ (CD8) and CD3+CD8− (CD4) subsets using CellQuest software. The net percentage of cytokine-positive cells within the CD4 and the CD8 compartment was determined by first subtracting background staining resulting from fluorochrome-matched isotype control Abs for each cytokine. Second, to correct for cytokine production by costimulation with anti-CD28 and -CD49d mAbs, we subtracted frequencies resulting from cells stimulated with these Abs in the absence of Ag. This two-step subtraction process ensured that derived cytokine frequencies were specific for the Ag tested. Background frequencies of isotype control Abs in PBMC did not exceed 0.02%, and frequencies of cells stimulated with costimulatory Abs in the absence of Ag did not exceed 0.05% for all subjects except one, for whom it was 0.1%. The cutoff value for HIV-specific responses was determined by using the above protocol to measure the frequency of HIV-specific IFN-γ- and IL-2-positive CD4 and CD8 cells in six HIV-negative subjects. None of the HIV-negative subjects had an HIV Gag-specific CD8 cytokine response above assay background. HIV-specific IL-2+ cells above background were not detected in the HIV-negative controls. One of the HIV-negative subjects had a CD4 T cell IFN-γ single-positive response above background. However, it was not possible to expand the Ag-specific cells from this individual with Ag/IL-2 (see below), or from the other five controls, to confirm whether the subject had protein-specific responses. Multiple sampling showed the ICS assay to give consistent values of 0.01% and above. Based on the above criteria, the cutoff value for the net percentage of cytokine positive cells was taken as 0.01%. PBMC were cultured in RPMI 1640 plus 10% human serum plus 20 μg/ml gentamicin at 2–3 × 106/ml in 24-well tissue culture plates (Nunc, Roskilde, Denmark). Overlapping peptides covering HIV-1 p24 protein (National Institute Biological Standards and Control) were added to each well at a concentration of 2 μg/ml. After 7 days of culture, IL-2 (National Institute Biological Standards and Control) was added to the medium at 3- to 4-day intervals at 20 IU/ml for a further 10 days of culture. Frequencies of Ag-specific cells were then determined as above by stimulating cells with p24 20-mer peptides or whole p24 protein (Protein Sciences, Meriden, CT) with costimulatory Abs for 20 h.
Statistical analysis was performed using INSTAT software and StatView 5.0 and GraphPad Prism. Between-group comparisons were made using Mann-Whitney U tests and Fisher exact test; p values of 0.05 or less were considered significant. Correlations of immune responses with disease markers were calculated using Spearman rank. In keeping with previous studies (16, 20), we first measured the total number of IFN-γ+ CD4 T cells that are activated (defined by CD69 expression) in PBMC of HIV patients following stimulation with HIV-1 Gag p24. We compared the frequency of specific IFN-γ+ cells with the frequency of specific IL-2+ CD4 cells activated under similar conditions. Cells were also stimulated separately with the superantigen SEB to measure cytokine production by the total Vβ CD4 T cell pool. The majority of cytokine positive cells were noted to be CD69+ (Fig. 1⇓, a and b), indicating that the ICS assay detected cytokine responses in a proportion of recently activated cells. No significant differences were noted between LTNPs and SPs in terms of p24-specific IFN-γ CD4 frequency, but the two groups differed in the number of p24-specific IL-2+ CD4 T cells. SPs had significantly fewer specific IL-2+ CD4s than did LTNPs (p = 0.0350). The median frequency of 0.11% p24-specific IFN-γ+ CD4 blood T cells noted in our study of LTNPs is in keeping with several previous reports (16, 19, 22, 31, 32). Magnitude of CD4 T cell IFN-γ and IL-2 responses to Gag p24 and SEB. a, Representative example of CD4+CD69+IFN-γ+ cells following stimulation with p24 peptides and SEB. The percentage of total IFN-γ+ and IL-2+ CD4+ cells are shown in LTNPs and SPs following p24 (b) and SEB (c) stimulation. All values have been corrected for isotype controls and production in the absence of Ag. Nonresponders (zero values) are shown on the base of each log plot at the frequency of 0.001. Significant differences are shown as determined by Mann-Whitney U test. The magnitude of the CD4 T cell cytokine response to the superantigen SEB was noticeably higher than that to p24 and similar to that in other reports (20, 24) but followed the same pattern as the specific cytokine response. LTNPs had a higher percentage of CD4 IL-2+ but not IFN-γ+ CD4 cells following SEB stimulation (Fig. 1⇑c). We were able to confirm the findings of others (22, 31) that the HIV Gag p24-specific IFN-γ cell frequencies measured by the ICS method reflected memory responses that can be expanded by in vitro Ag/IL-2 stimulation. Of the 11 LTNPs and 8 SPs tested, we successfully isolated p24-specific CD4 T cell lines from only 5 LTNPs (not shown). Representative data from one individual (Fig. 2⇓) shows 3.7% p24-specific cells following Ag/IL-2 expansion, a marked increase from an autologous blood frequency of 0.03% (not shown). Although the p24-specific CD4 line was expanded with the peptide pool, the ensuing cells recognized specific epitopes on the homologous protein, confirming that the peptide responses detected in blood by the ICS assay reflect memory responses to the Gag p24 protein. Enrichment of IFN-γ response in p24-specific T cell lines. Restimulation of p24 cell line generated from LTNP 113 with p24 protein at a range of concentrations is shown. IFN-γ production and CD69 expression is shown in gated CD4 T cells. All values have been corrected for isotype controls and production in the absence of Ag. Isotype control value is shown for the cell line. We next determined whether the lower number of IL-2+ cells in the SP group was due to fewer cells that produced IL-2 but not IFN-γ, or due to cells that produced both IL-2 and IFN-γ. It is well recognized that both IFN-γ+ effector and IFN-γ− noneffector CD4 T cells can produce IL-2 upon activation (25, 33). Therefore, PBMCs were stained simultaneously for IFN-γ and IL-2, and the frequency of CD4 cells single positive for IFN-γ or IL-2, as well as cells that stained for both IL-2 and IFN-γ (double positive), was enumerated (Fig. 3⇓a). The percentage of single IFN-γ+ and single IL-2+ cells was noted to be similar in LTNPs and SPs. However, the median frequency of p24-specific IFN-γ+IL-2+ (double-positive) effector cells and the number of responders with a IFN-γ+IL-2+ response were significantly higher in LTNPs compared with SPs (p = 0.0015, Mann-Whitney U test; and p = 0.0198, Fisher exact test) (Fig. 3⇓b). In contrast to p24 stimulation, SEB stimulation revealed fewer Vβ+ single IL-2+ cells and fewer IFN-γ and IL-2 double-positive cells in progressors than in LTNPs (Fig. 3⇓c). The data indicate that IL-2 production by both IFN-γ+ effector and IFN-γ− noneffector Vβ+ CD4+ T cells is impaired in progressors. However, fewer progressors had IFN-γ+IL-2+ effectors within the HIV-specific pool of CD4 T cells (Fig. 3⇓b). 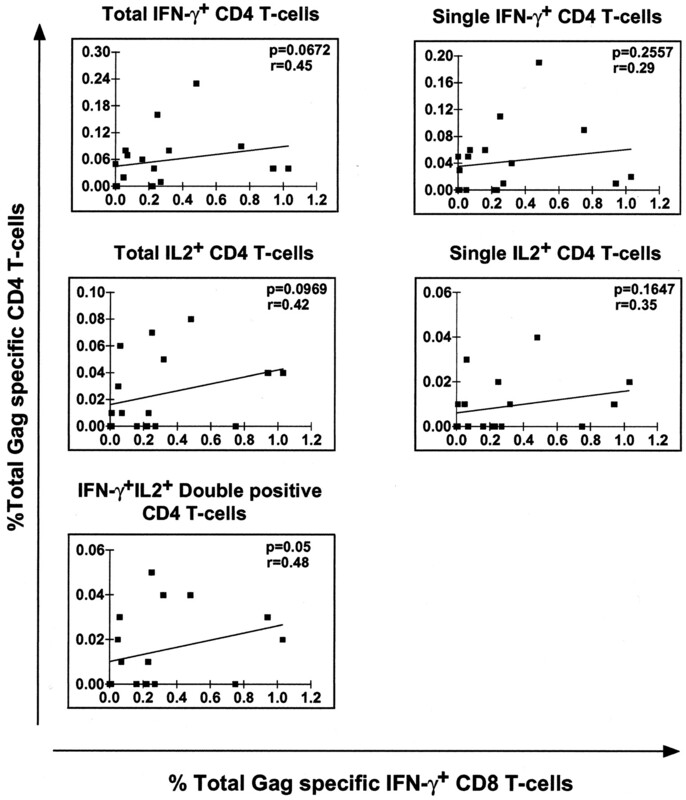 Comparison of CD4 T cell frequencies of single IFN-γ+, single IL-2+, and IFN-γ+IL-2+ double-positive cells following p24 and SEB stimulation in LTNPs and SPs. a, Representative plots gated on CD4 T cells showing IL-2 single-positive, IFN-γ+ single-positive, and IFN-γ+IL-2+ double-positive cells in an LTNP following SEB and Gag p24 stimulation. 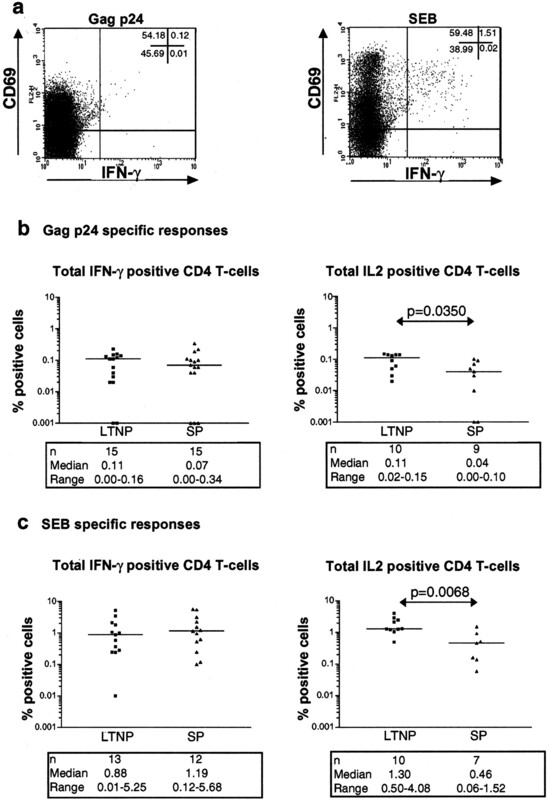 Frequencies of single IFN-γ+, single IL-2+, and IFN-γ+IL-2+ double-positive CD4 T cells in LTNPs and SPs following p24 stimulation (b) and SEB (c) stimulation. All values have been corrected for isotype controls and production in the absence of Ag. Nonresponders (zero values) are shown on the base of each log plot at the frequency of 0.001. Significant differences are shown as determined by Mann-Whitney U test. In addition to IL-2 production, CD4 T cell activation and function is determined by CD28 expression (26). Therefore, we correlated IL-2 production with CD28 expression (Fig. 4⇓a). To gain insight into how the HIV-specific IL-2 response compares with cells of a different specificity, we measured p24- and CMV-specific IL-2+CD28+ responses in the same subject. Higher frequencies of p24-specific CD28+IL-2+ in LTNPs compared with those in SPs were noted, but they did not differ significantly (Fig. 4⇓b). However, analysis of the number of responders revealed a statistically significant difference (p = 0.0461, Fisher exact test) with 8 of 14 LTNPs having detectable p24-specific CD4+CD28+IL-2+ responses compared with just 2 of 13 SPs (Fig. 4⇓b). A similar observation was made regarding CMV-specific cells. LTNPs had significantly higher frequencies of CD28+IL-2+ CMV-specific cells compared with SPs (p = 0.006) (Fig. 4⇓c). Analysis of CD4 T cell CD28+IL-2+ cells following stimulation with p24 and CMV. 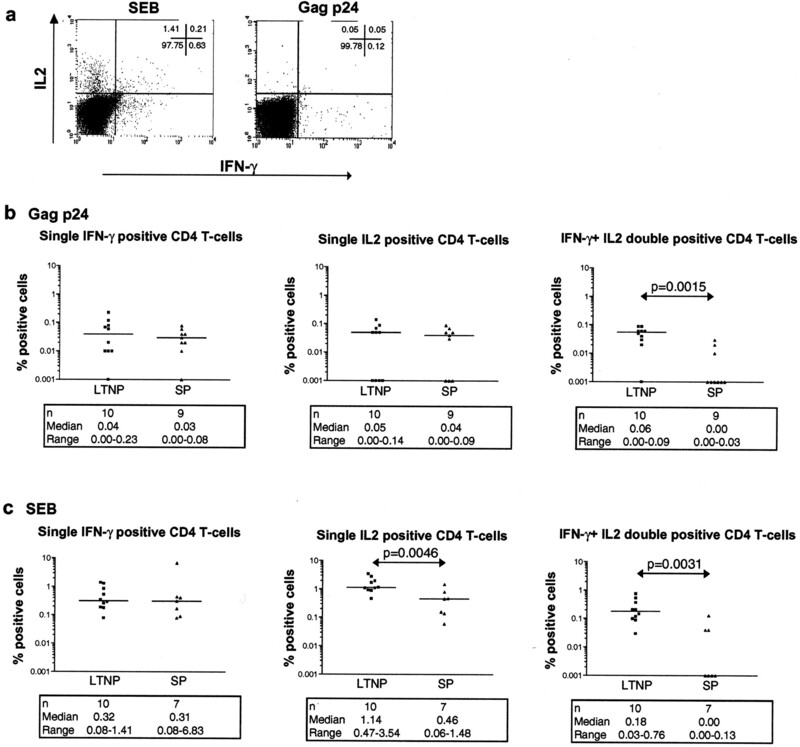 Shown are representative plots gated on CD4+ T cells demonstrating CD28 and IL-2 frequencies in one LTNP following p24 stimulation (a) and following CMV stimulation (b). Shown are frequencies of CD28+IL-2+ and CD28−IL-2+ CD4 T cells after p24 (c) and CMV (d) stimulation for LTNPs and SPs. All values have been corrected for isotype controls and production in the absence of Ag. Nonresponders (zero values) are shown on the base of each log plot at the frequency of 0.001. Significant differences are shown as determined by Mann-Whitney U test, except that the asterisk represents a significant difference determined by Fisher exact test based on the number of responders. Concomitant with a fall in CD28+IL-2+ number, we noted the expansion of impaired Th cells, defined as the IL-2+ subset that lacked CD28 (27, 28, 29). A striking difference was noted in the accumulation of the CD28−IL-2+ subset based on cell specificity. Impaired CMV-specific CD28−IL-2+ Th cells were rare in LTNPs but clearly present in SPs (Fig. 4⇑c). However, impaired p24-specific CD28−IL-2+ Th cells were evident in both LTNPs and SPs (Fig. 4⇑b). Thus, progressors had fewer p24- and CMV-specific CD28+IL-2+ CD4 Th cells than nonprogressors had. In addition, our data show the presence of HIV-specific impaired CD4 CD28−IL-2+ Th cells in LTNPs (Fig. 4⇑b) in the absence of such cells specific for CMV (Fig. 4⇑c). We next determined whether the HIV-specific CD4 responses that differed between LTNPs and SPs correlated with CD4 count and virus load, two well-recognized markers of disease progression. We also compared the HIV-1 Gag p24 response with the response to total Gag by stimulating cells with a pool of 15-mer peptides spanning the entire HIV-1 Gag sequence. We envisaged two potential advantages from including a study of the Gag 15-mers. First, it would give an indication of the total Gag response, including responses to perhaps additional CD4 epitopes in Gag (p17) to those present in p24. Second, 15-mers have been noted to be more efficient than 20-mer peptides in stimulating HIV-specific CD8 cells (19, 34). Therefore, stimulation with 15-mers would enable us to directly correlate specific CD4 and CD8 responses (see below). Based on the importance of the specific IFN-γ+IL-2+ CD4 response, we first tested 10 subjects in parallel for both Gag- and Gag p24-specific IFN-γ and IL-2 responses. Although the median frequency of the IFN-γ+IL-2+ CD4 response to both stimuli did not differ significantly (Fig. 5⇓), there were more IFN-γ+IL-2+ responders to the total Gag 15-mers than to the Gag p24 20-mer peptides (8 of 10 responders to Gag vs 5 of 10 responders to Gag p24). This difference may reflect responses to additional CD4 epitopes in total Gag that are absent in the p24 peptide pool. Analysis of IL-2 and IFN-γ frequencies also followed a similar trend (not shown), consistent with other data showing no significant differences in the percentage of IFN-γ+ CD4 cells stimulated by the Gag 15-mers compared with the 20-mer p24 peptides (19). The Gag response differed between LTNPs and SPs as did the Gag p24 response. Thus, the numbers of Gag IL-2+ and IFN-γ+IL-2+, but not single IFN-γ+, cells differed significantly between LTNPs (n = 10) and SPs (n = 7). (LTNP vs SP, p = 0.0330 and 0.0250 for Gag IL-2+ and Gag IFN-γ+IL-2+, respectively). Comparison of Gag p24 20-mer-specific and Gag 15-mer-specific IFN-γ+IL-2 double-positive CD4 T cells. CD4 T cells were stimulated in parallel with Gag p24 20-mer peptide pool and Gag 15-mer peptide pool from 10 patients, and the percentage of IFN-γ+IL-2 double-positive cells was enumerated. Individual percentages of responses are shown. All values have been corrected for isotype controls and production in the absence of Ag. Patients 1, 206, 48, and 43 are SPs, and patients 37, 11, 205, 201, 202, and 134 are LTNPs. Using Spearman rank correlation, we correlated p24-specific and Gag-specific CD4 responses with virus load (vRNA) and absolute CD4 counts (summarized in Table I⇓). Consistent with earlier studies, we noted an inverse correlation between vRNA and absolute CD4 T cell counts in our cohort (Fig. 6⇓a). 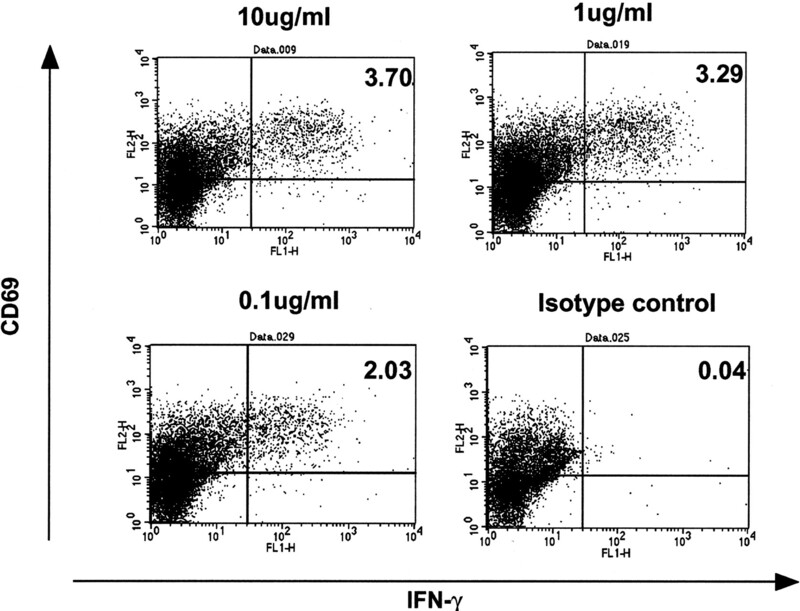 The Gag-specific IFN-γ+IL-2+ response correlated positively with absolute CD4 count (Fig. 6⇓b, r = 0.48 and p = 0.05) and inversely with virus load (Fig. 6⇓b, r = −0.57 and p = 0.0169). The p24-specific IFN-γ+IL-2+ response showed a similar significant linear relationship with CD4 count (Fig. 6⇓c, r = 0.79 and p = <0.0001) but did not correlate with virus load (Table I⇓; Fig. 6⇓b). Studies with SEB confirmed the importance of the IFN-γ+IL-2+ CD4 T cell subset in HIV infection (24). IFN-γ+IL-2+Vβ+ CD4 cell number correlated positively with CD4 count and inversely with virus load (Fig. 6⇓d). Correlation of CD4 T cell responses with markers of disease progression. Shown are viral load vs absolute CD4 count (a); and p24-specific, Gag-specific, and SEB-specific IFN-γ+IL-2 double-positive CD4 T cell frequencies vs viral load and absolute CD4 count (b). The values of p and r shown in each figure were determined by the Spearman rank correlation. The solid line represents a regression line. The importance of CD4 subsets defined by IL-2 and CD28 expression was also tested. The p24-specific CD28+IL-2+ cell response correlated inversely with virus load (r = −0.4 and p = 0.0376) but did not correlate with CD4 count (Table I⇑). p24 CD28−IL-2+ responses did not correlate with either marker of disease progression. In contrast, CMV-specific CD28+IL-2+ responses, which were clearly different between LTNPs and SPs (Fig. 4⇑d), correlated positively with CD4 count but not with viral load. The striking expansion of CD28−IL-2+ cells noted in SPs (Fig. 3⇑c) correlated both positively with virus load (r = 0.52 and p = 0.0058) and inversely with CD4 count (r = −0.53 and p = 0.0041). To take into account variation in CD4 count between subjects, we calculated the absolute number of Gag- and p24-specific cytokine-positive cells per milliliter of blood and correlated these with virus load. The absolute number of Gag-specific as well as SEB-specific IL-2+ and IFN-γ+IL-2+ double-positive CD4 T cells correlated inversely with virus load (Table I⇑), confirming the potential importance of IL-2+ CD4s and the IFN-γ+IL-2+ subset in immunity to HIV. However, the negative correlation of the percentage of p24-specific IFN-γ+IL-2+ and IL-2+ CD28 subsets with virus load was lost when absolute numbers were used to test correlation, indicating that these subsets fluctuated with CD4 count. Betts et al. (19) found that the magnitude of the Gag-specific CD4 IFN-γ response did not correlate with the magnitude of the Gag-specific IFN-γ CD8 response. Given the importance of the Gag-specific IFN-γ+IL-2+ CD4 subset (Fig. 3⇑), we investigated whether this CD4 subset influenced the specific CD8 IFN-γ response. In 10 LTNPs and 7 SPs, frequencies of IFN-γ+ CD4 and CD8 T cells were enumerated in the same sample. CD8 T cell IFN-γ frequencies did not differ between LTNPs and SPs, and ranged from 0.00 to 1.04% with a median of 0.24% in all 17 subjects, which is consistent with several others reports (35, 36, 37, 38) where Gag-specific CD8 IFN-γ+ frequency was measured by either the ICS or the ELISPOT assay. Data in Fig. 7⇓ show that, of the Gag-specific CD4 T cell subsets, only the double-positive IFN-γ- and IL-2-producing cells correlated directly with the CD8 IFN-γ response (r = 0.48 and p = 0.05). We also investigated whether the percentage of Gag-specific IFN-γ+ CD8 T cells correlated with virus load or with CD4 count. In contrast to other reports (3, 37, 39, 40) showing a negative correlation between virus load and specific CD8 responses, but in keeping with data from Betts et al. (19), we did not observe a linear relationship between Gag-specific CD8 IFN-γ frequency and virus load (r = 0.06 and p = 0.82) (data not shown). Correlation of HIV-1 Gag-specific CD4 and CD8 responses. The percentage of Gag-specific IFN-γ+, IL-2+, and IFN-γ+IL-2+ CD4 cells was correlated with the percentage of Gag-specific CD8 T cells producing IFN-γ. The values of p and r shown in each figure were determined by the Spearman rank correlation. The solid line represents a regression line. CD4 Th responses determine the fate of many chronic virus infections including that of HIV infection (8, 10, 11, 41), as demonstrated by the inverse correlation between specific CD4 T cell proliferative responses and virus load (15). CD4 responses may govern HIV immunity partly by influencing the magnitude of the specific CD8 response (10), which many studies (3, 39, 40), including those in SIV-infected macaques (42, 43), show to be critical for virus clearance. However, the precise nature of specific CD4 T cells that correlate inversely with virus load (15) and positively with the number of specific CD8+ CTL precursors (14) has remained unclear. What is increasingly clear is that cells that produce IFN-γ alone do not reflect the proliferative response. Studies using the ICS assay (20) and the ELISPOT technique (21) have recorded similar numbers of HIV-specific IFN-γ+ CD4 T cells in all stages of HIV infection with no correlation with virus load (19) or indeed the magnitude of the specific CD8+IFN-γ response (19). In this paper we tested the hypothesis that expression of CD28 and production of IL-2, both critical for T cell proliferation (25), rather than the capacity to produce IFN-γ alone, may be associated with good clinical outcome in HIV infection. Our data support this hypothesis. Like other studies (16, 19, 20, 22), we noted that the number of Gag-specific CD4 cells based on IFN-γ production alone did not correlate with either virus load or the magnitude of the Gag-specific CD8 response. However, our findings further extend previous work highlighting the importance of the IFN-γ and IL-2 double-positive CD4 subset, enumerated after mitogen or SEB stimulation, in clinically well patients (23, 24). LTNPs had significantly higher numbers of total Gag-specific and Gag p24-specific CD4 cells that produce both IFN-γ and IL-2 than did progressors. LTNPs were also noted to have p24-specific CD28+IL-2+ cells that were rare in progressors. However, after correcting for differences in CD4 count between patients, only the total Gag-specific IFN-γ+IL-2+ CD4 response correlated inversely with virus load, emphasizing the potential importance of this subset in immunity to HIV. What might account for the selective disruption of the specific IFN-γ+IL-2+ CD4 subset in progressors? Cells that produce IFN-γ are by definition effector memory cells (33), whereas cells that produce IL-2 would include three subsets consisting of naive cells, effector memory cells (33), as well as Ag-experienced effector cells that have returned to a resting state (44). The selective reduction in the number of double-positive effector cells may be a consequence of HIV infection. IL-2 is important in promoting HIV replication (45), and CD4 subsets that produce IL-2 are more susceptible to HIV infection (46). In addition, CD4 memory cells are more susceptible to HIV than CD4 naive cells (45). Within the CD4 compartment, IFN-γ and IL-2 double-positive cells are therefore likely to be exquisitely susceptible to HIV. Our data showing a significant correlation of the p24-specific and Gag-specific IFN-γ+IL-2+ subset with CD4 count is suggestive of this possibility. Indeed, Douek et al. (47) recently showed that HIV-specific cells in infected subjects had a higher viral load than that of cells of other specificity, emphasizing the possibility that the preferential loss of specific cells in HIV infection may be due to their increased susceptibility to HIV infection. As with IL-2 secretion, CD28 expression is well recognized to be important in T cell proliferation (26). We show that progressors had fewer specific CD4 T cells that are double positive for CD28 and IL-2 than did nonprogressors. In addition, we show that even nonprogressors had fewer CD28+IL-2+ CD4 cells specific for p24 than for CMV. The disruption to the specific CD28+IL-2+ subset may in turn reflect differences in the state of activation of HIV- compared with CMV-specific cells. CD28 levels and function are up-regulated during T cell activation with polyclonal activators (26, 48). Engagement of CD28 with anti-CD28 mAb also augments proliferation of human T cells in the presence of tetanus-pulsed costimulation-deficient APC (49). However, engagement of the CD28 pathway with anti-CD28 mAb on CD4 T cells that have been preactivated with PHA causes down-regulation of CD28 and transient desensitization of the CD28-activation pathway (50). HIV infection is recognized to cause nonspecific immune activation (45) with T cells specific for HIV likely to be the most activated. Therefore, impaired CD28 responses in HIV infection may be a consequence of reactivating cells that are already highly activated with loss of HIV-specific CD28+ responses occurring before those to another Ag. This might be one reason for the presence of CD28−IL-2+ cells specific for p24 but not for CMV in some LTNPs and why progressors have higher numbers of both p24- and CMV-specific CD28-negative helper cells than do nonprogressors. 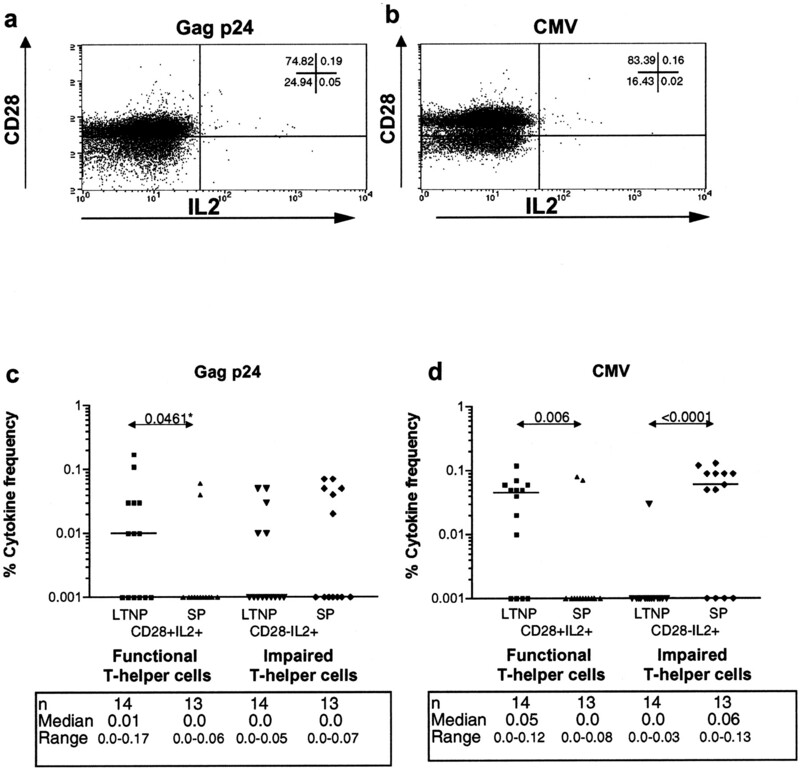 Fewer p24-specific helper cells compared with CMV-specific helpers may explain the selective impairment of p24-specific compared with CMV-specific CD8s in HIV-1 infection. HIV-1-specific CD8 T cells have been shown to produce antiviral cytokines but are impaired in cytolytic function (17). Indeed, HIV-1-specific CD8s, unlike CMV-specific CD8s from the same patient, have been shown to be terminally differentiated effectors that express low levels of the cytolytic protein perforin (18). Specific CD4 T cells that express IL-2 and CD28 along with other molecules such as CD40 ligand may be essential for HIV-specific CD8 T cell differentiation (51). Taken together, we have defined the phenotype and cytokine profile of CD4 subsets associated with nonprogression, the loss of which may contribute to the eventual failure of specific CD8 T cell immunity to HIV. ↵1 This work was supported by Guy’s, King’s, and St. Thomas’ Special Trustees Grant R990531 and King’s College Hospital Joint Research Committee Grant 228. ↵3 Abbreviations used in this paper: LTNP, long-term nonprogressor; SP, slow progressor; ICS, intracytoplasmic cell staining; SEB, staphylococcal enterotoxin B.